Arizona Beverage Co., a brand of Ferolito Vultaggio & Sons, recently introduced Arizona Infused Water, a line of four lightly sweetened and flavoured waters. The waters are packaged in a proprietary 20-oz (600 ml) plastic bottle. A colourful lifelike illustration of fruit printed on a shrink sleeve covering the ball-shaped top of the bottle right under the bottle screw closure. Under the ball-shaped top the bottle is stretched, where a paper label is wrapped around the middle to give the illusion that the water drips through “the fruit stored in the ball”, before the water is consumed. 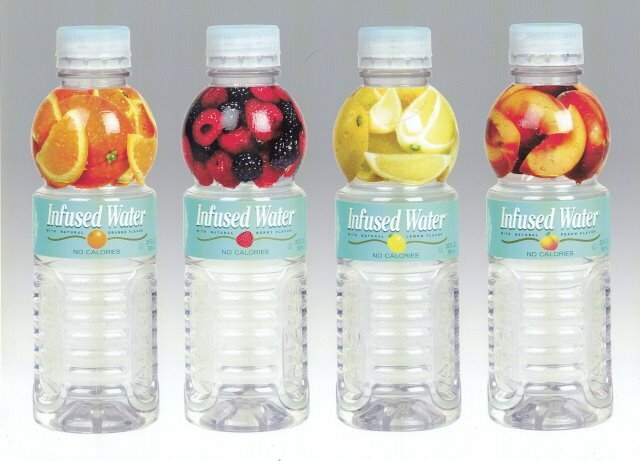 Constar International Inc., a producer of polyethylene terephthalate (PET) plastic containers, designed and produced the imaginative package for the launch of Arizona’s new Infused Water product. Constar’s challenge was to create a unique package that would help Arizona differentiate this new product in a market that is seeing a large number of new entrants. Due to the vacuum generated as a result of being hot filled, new and innovative vacuum absorption features had to be designed and developed. Arizona Beverages did not want to use the standard under-the-label vacuum panels common to most hot-filled beverages. Using Finite Element Analysis (FEA) Constar manipulated the design to produce an innovative combination of functional elements including material distribution, horizontal ribs and three customized vacuum panels. The entire bottle geometry works to relieve the vacuum. This design brings together a number of visual elements to create a distinctive look. The neck portion of the bottle is spherical and provides the right location for an eye-catching shrink label. The upper portion of the base section accepts a more traditional wrap-around label leaving the lower portion of the base for a unique use of “branding panels.” These provide an easy grip feature for the consumer and reinforce the Arizona name, which is embossed in the centre of the vertically oriented panels.